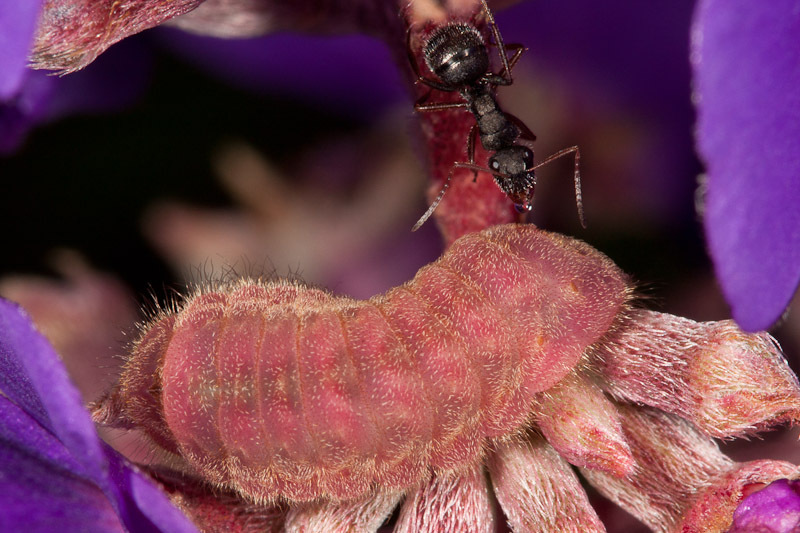 Here’s an ant in the Formica genus tending a caterpillar in the Lycaenidae family. 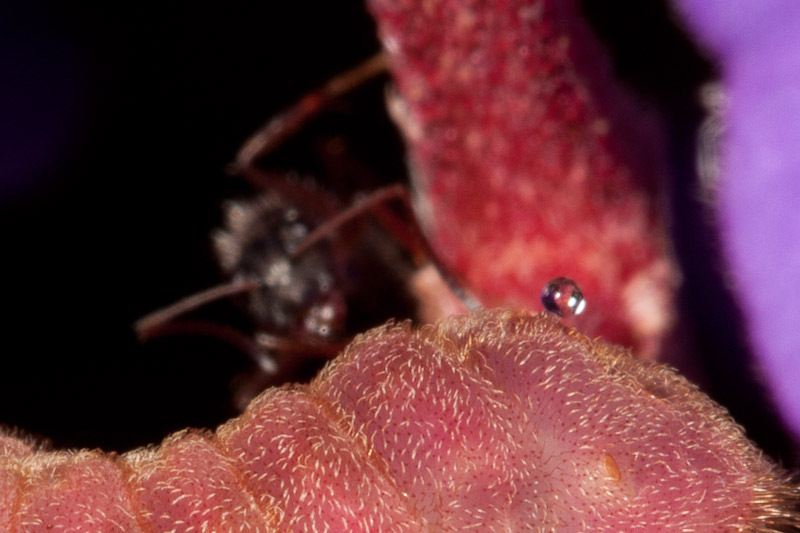 The ant has just taken a drop of a sugary substance produced by a gland at the rear of the caterpillar. Here’s a shot from about 10 seconds earlier where you can see the drop sitting atop the gland and the ant fast approaching. I’m not sure what flowers these caterpillars are eating, but they are pretty well camouflaged settled in among the flower buds. Once I spotted the first one, I started looking for them and found quite a few wherever I spotted these flowers. The ants generally provide protection for the caterpillars in return for nourishment. Here’s another one where the ants appear to be failing in their duty. I spotted a wound (not visible here) on the head (to the right) where a parasite had entered or exited. You can see something odd about a few of the last abdominal segments. The hairs are missing as if a wound has healed. You can also see there’s another drop of the ant reward forming near the rear. Very interesting. The lighting is nicely diffused – how’d you do it? Nothing special. This is just the Canon 100mm macro with the MT-24EX macro twin lite. I suspect it’s mostly just that everything in the photo lacks reflective surfaces. As usual, there’s a bit of post-processing, but nothing excessive. Please– do you know exactly what the caterpillar is? My brother found a green one shaped just like it; then I found a pink one. I love taking pictures of bugs, and I love knowing what they are. I managed to track down that it is in the Lycaenidae (hairstreak) family, but haven’t been able to find out which one it is. Thanks! Nope, sorry. 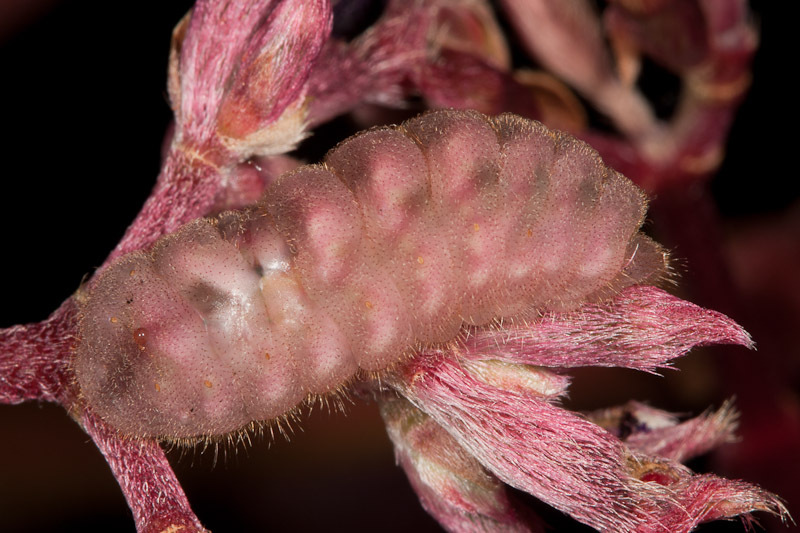 It might not even be possible to identify it to species from the caterpillar alone. Sorry for bothering you– after more extensive research on various identification sites, I’m pretty sure it’s a Strymon melinus, or gray hairstreak. I could be wrong, but it’s pretty close.